I wasn’t going to bother with an “About Me” page. I’ve often seen these pages on websites where people are just saying how “great” they are. I’m not comfortable with that, particularly as there’s nothing all that great about me, but I got to thinking…………………..
How can I expect people to read my Blog when they have no idea of my experience or whether I have any relevant knowledge of the subject I’m blogging about ? So, here we go. I’m married with 4 wonderful children and 7 fantastic grand children (I started really young, and so did my eldest son !!!). Although I’ve been taking photos most of my adult life, photography is my second career and I’ve been a full time professional earning a living from wedding photography for 10 years now. Before that I had a 30 year career dealing with some of the most unfortunate, and some of the most unpleasant people in society. In essence, I spent 30 years of my working life dealing with the worst humanity has to offer. Getting invited to so many weddings and meeting such lovely people in such happy circumstances really is pure joy to me. The complete opposite of my old career. I now get to see the best of humanity. I fell into wedding photography accidentally really. From the number of times I have heard that phrase, I know I’m not the only one. I loved taking photos and was asked to photograph a couple of family weddings. I refused (politely). As I didn’t know what to do I didn’t want the responsibility of taking their wedding photos for them. What I did do though was, with the permission of the pro’s they hired, act as a kind of “second shooter”. I loved it. 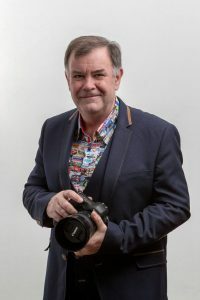 So I paid for some professional training with The Royal Photographic Society and The Society of Wedding and Portrait Photographers, then arranged to work as a “second shooter” for a local photographer to get some “real world” experience (you can only learn so much in a classroom). I retired from my old job and threw myself into photography. I started out charging not very much (around £300-£350 per wedding) to build up my experience and continued to go on further courses to improve my skills. We’re talking not just about photography skills here, but business skills as well. In fact, if you want to earn a living from photography, the business skills part is the more important of the two!! Over the years I’ve managed to build my business up gradually to the level where I’m not “snowed under” with work, but I am “comfortably busy”. It’s a nice place to be as there’s no stress involved!! The bills are all being paid, I have a good work/life balance and I’m doing something I really love doing. So going back to the question I posed at the beginning of this page and do I know anything about the subjects I Blog about? Well, I have an enormous amount of experience of dealing with people from all walks of life, which comes in particularly handy when dealing with wedding guests. I have built up a business from scratch over the past 8 years to a level where I am happy, paying all my bills and not too stressed. (I never set out to be “world famous” and with so many business failing within 2 years of start up, I’m quite pleased with what I have achieved). Having said that, I know that feeling too comfortable can be a bad thing. Take your eye off the ball and things can go downhill very quickly indeed. So I know everything, right? No, I don’t know everything. If anyone ever thinks that, they are kidding themselves and in for some nasty shocks. I know enough about the things I need to know about to get where I want to be at the moment, but I still have a great deal to learn. I seem to learn something new every day and I hope to continue learning for the rest of my life.